Harbor Springs: Breathtaking views, impeccable grooming and a casually upscale restaurant mark this golfing experience. 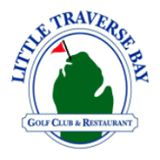 Charm your senses with panoramic views from both course and clubhouse at Little Traverse Bay Golf Club and Restaurant. The splendor of Lake Michigan’s Little Traverse Bay provides a visual backdrop from the dining room and first tee. No wonder Hole #1 is said to be “the best starting hole in Northern Michigan. Menu here. Facebook here. Hours are seasonal.